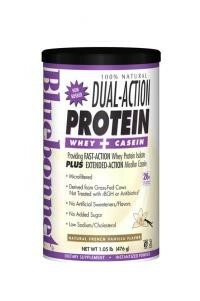 Bluebonnet’s 100% Natural Dual-Action Protein is sourced from grass-fed cows that are not treated with antibiotics and recombinant bovine growth hormone (rBGH), also known as bovine somatotropin (BST). Additionally, this product provides a dynamic blend of whey protein isolate and micellar casein that works throughout your workout and during the recovery phase at night. Whey protein isolate has the highest biological value (BV) of any protein on the market, which refers to a protein that has all the necessary essential amino acids for protein biosynthesis and is fast-acting to support amino acid replenishment required during and after strenuous activities. Plus, this revolutionary protein formula includes extended-action micellar casein that works well beyond strenuous activities to continually rebuild broken down muscle. While both whey protein isolate and micellar casein are rich sources of branched chain amino acids (BCAAs) and glutamic acid, whey protein isolate alone provides the naturally occurring immunoglobulins that help support the immune system, which is transiently depressed during strenuous activity.